Over the years, I have inherited a few household items from my mom. And while most of them were at the time simply mementos from my 1970s childhood, a few also turned out to be icons of mid-century design. 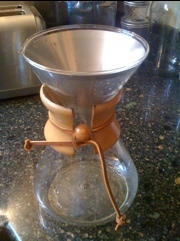 One such “hand-me-down” was an original Chemex glass coffee maker that my mom pawned off on me about 20 years ago. I liked the hour-glass shape and the wood grip, held together by a piece of old leather string. 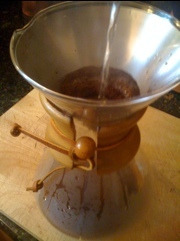 When I had my first apartment in NW Portland, I occasionally tried to use the Chemex to brew up some easy-to-make drip coffee, placing a few scoops of grounds in a paper filter and pouring hot water over it. Unfortunately, I either had the wrong filters or just couldn’t get the hang of it because more often than not, the ground coffee flowed over the paper filter and into the pot, making a gritty, ground-filled drink. 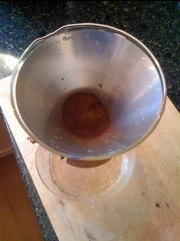 My mom’s old Chemex pot has followed me around ever since, but collected more dust than coffee – until recently. 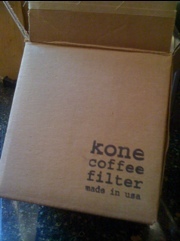 When I heard about the Kone filter, an innovative new reusable coffee filter made right here in Portland by the creative folks at Coava Coffee and had the chance to have a cup of perfectly brewed pour-over coffee at both Mr. Green Beans and Coava, I had to get one myself. Plus, I liked the idea of buying local and not having to throw away, or compost, my filter after each use. The metal-mesh Kone, at $50, is a pretty penny, for sure. But if you compare it to the price of paper filters over the life of your pot, eventually it all pays off, especially if you drink as much coffee as we do. Following the instructions of Coava’s barista (see below), it only took 20 years to brew a perfect cup of pour-over coffee in my now-vintage-vintage Chemex pot. 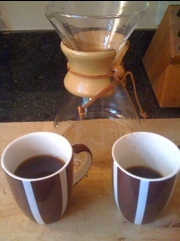 The metal Kone filter fits right into the top funnel of the Chemex. I expected it to look a little like a strainer but the holes are mesh-like, allowing the water to pour over the finely ground coffee ever so slowly and seep into the pot. For one pour-over, Coava recommends: 21 grams ground coffee, 340 grams H20 and 3 to 3.5 minutes to drip/brew. To find out more about the Chemex coffee maker, check out a post by Portland Roasting Company on their visit to the original factory. Oh yeah! Zagat and Huffington Post put Portland's Ristretto on their list of the 10 coolest independent coffee shops in the U.S. a month ago.